In our rush for newer, quicker, better, we seem to be missing out on what we fundamentally crave, a calmer, gentler, sweeter, and more gracious life. Is it easy to achieve such a life?Definitely not.Is it possible?Absolutely, positively, certainly, yes. In today's world of modern conveniences (voice mail, electronic mail, facsimiles, etc.) the work day for most North Americans has not been shortened, as anticipated and promised by the creators of these technologies. In fact, the opposite holds true, with management often expecting that more work will be produced in less time. People today are juggling family responsibilities, jobs, and social obligations. In their haste to achieve it all, something is still lacking. In Gracious Living in a New World, Alexandra Stoddard offers her ideas for achieving a gracious lifestyle. Her inspiration stems from the experiences she shared with her husband, Peter, when they moved from New York City to a little cottage in a tiny sea-side Connecticut village. Alexandra Stoddard's message is positive and practical. It is also relevant to everyone. City-slickers and village dwellers alike will find relief and refuge amongst Alexandra's trademark colorful pages. But most importantly, readers will find the inspiration to live a gracious life. 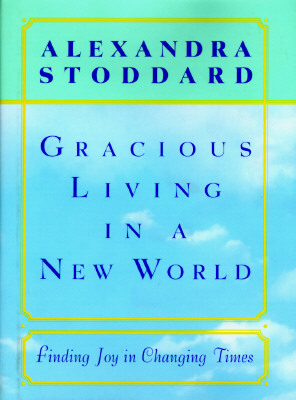 Description: Stoddard,Alexandra Gracious Living In A New World: Finding Joy In Changing Times Edge/ corner wear to dust jacket/ book. Creases to dust jacket cover/ spine. Pages clean. Binding tight. All U.S. orders are shipped with tracking number and email confirmation. All Orders Shipped With Tracking And Delivery Confirmation Numbers.